Best tool for the Apocalypse? Both my friend Neal and survivorman swear by their multi-tool. I would expect both would not be caught in the Apocalypse without it. I was always find the thing inconvenient. When I need to use it I am already doing something with my hands. While it is true that fine detail work might call for the multi-tool, for the vast majority of stuff I find myself doing in the backyard my old painter’s tool has been just fine. 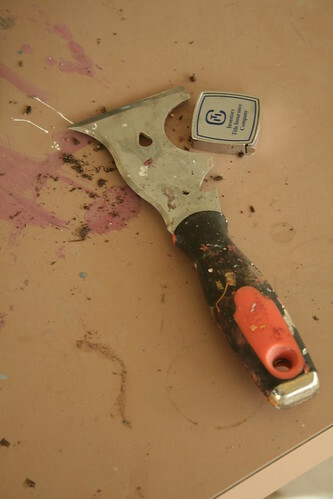 The painters-tool allows me to pry, screw (loose screws), open cans, hammer a light touch, and pry nails. The multi-tool allows me to do the same (and more) but every time I use it I got to put down what I am using. I have been packing the GTFOOD bag and I think I am going to include a painter’s tool. It’s better for sloppy work on the go. The painter’s tool is also easier to use when opening a beer, which makes it better for Pre-Apocalypse backyard gardening activities. Below: My old painter’s seven-in-one tool.